Firstly a company called ‘Crush’ from Norfolk. They make Cold Pressed Rapeseed Oil – and they are – Artisan producers of a range of Oils, dressings & NEW Cereals. I love the packaging! I tried a few of the dressings my favourite was the ‘zingy lemon’ dressing and I also tried their ‘Gnaw chocolate and hazelnut’ Granola- Yummy. I came away with a bottle of extra virgin cold pressed oil, it was very raw tasting almost like raw sunflower seeds, it wasn’t like others I had tasted. The man on the stall was very helpful and enthusiastic. Again the packaging is very eye-catching! They make a range of Dressings, infused oils, curds and a chilli jam! I can honestly say I was happy with everything I tried on this stall but was particularly taken with their range of curds, mainly because I’d never seen any flavours like these before and I like to try something ‘different’. 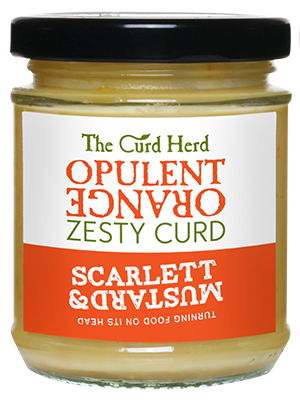 The curds come in Opulent Orange, Blackcurrant and Star Anise, Passion fruit and Lemon, and Lime and Mint. I came away with Blackcurrant and star Anise and Lime and mint. Very happy with my items but also very impressed with the Lady on the stall, she was full of good ideas of how you could eat them some of her suggestions were on pancakes, on crumpets, on butterfly cakes! This product (along with other Italian items) was on a stall with another brand, but because it is WHITE balsamic Vinegar it caught my eye. 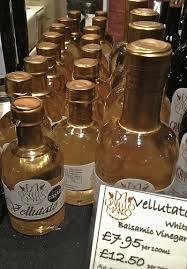 It is lighter and sweeter in flavour and less syrupy than dark balsamic vinegar. For 100ml it was £7.95 so I will use it sparingly! ← Todays Doggy care Post is about LOVE!